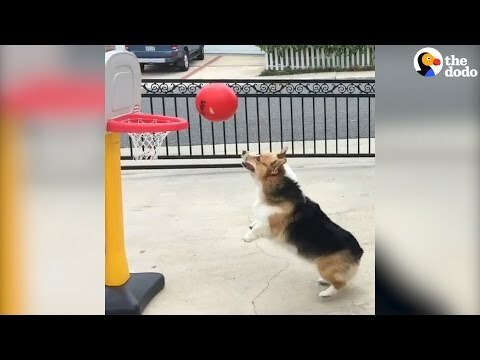 Home / Dog Playing / Video) Corgi Dogs Playing Basketball! They say that a dog is a man's best friend and pet lovers usually treat them as part of the family. Taking care of our dogs does not only include feeding them or taking them for a walk. Dogs need to play too and so giving quality time to play can help develop a better communication, understanding, and respect with your dog. Playing games involves communication and working together. Playing is an important factor in building up the social relationship as dogs are social creatures too. Playing games is a basic way of imitating real life. Obedience can be taught to your dog through games and following basic instructions can be fun. There are games that came from pet owners and these are testimonies on how games can be both fun and educational. Below is a YouTube video of two talented corgi dogs playing with an amazing basketball playing ability. Enjoy the video! Video) Corgi Dogs Playing Basketball! DoglopedixThey say that a dog is a man's best friend and pet lovers usually treat them as part of the family. Taking care of our dogs does not only include feeding them or taking them for a walk. Dogs need to play too and so giving quality time to play can help develop a better communication, understanding, and respect with your dog. Playing games involves communication and working together.